Orkney is the destination of choice for ship to ship oil transfers. The Harbour Authority in Orkney has two bragging rights that it is very proud of. Firstly, it has Scotland’s longest deep-water commercial berth at Hatston just outside Kirkwall, and secondly it has Europe’s largest natural harbour of Scapa Flow (at 125 square miles) both within its estate. For good measure, Orkney is also the cruise capital of the UK and the European destination of choice for ship to ship transfers of crude oil and other liquid hydro carbon products. Since the introduction of its ground-breaking ballast water management policy for Scapa Flow, approved by Orkney Islands Council in 2014, and the subsequent granting of an Oil Transfer Licence by the MCA in 2015, oil and gas business has grown exponentially, especially for ship to ship operations. In June 2018, eight operations were completed involving over 20 tankers. Michael Morrison, business development manager with the Harbour Authority, said: “Continued success in the oil and gas business is now all down to standards of delivery and an impeccable environmental record in Scapa Flow. “It was quite a challenge to push through approvals for our ballast water management policy, but we had to deliver the business once the policy was in place, otherwise it would all have been for nothing. “We are a risk adverse Harbour Authority and treat every single tanker movement as it were our first. This avoids complacency and underpins our impeccable environmental record going as far back as the 1970s when the Flotta Oil Terminal was first opened. “The Terminal is now receiving a tanker uplifting crude on a weekly basis and this with our STS work keeps the fleet and operational staff busy, to say the least. 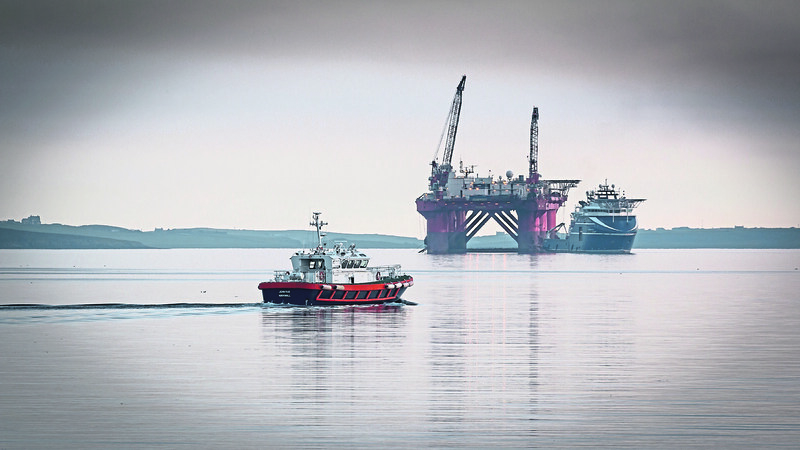 The arrival for anchorage and maintenance of full drilling rigs and accommodation platforms for the first time in Scapa Flow in 2016 provided a first-class opportunity for the local marine supply chain to demonstrate its diverse skills for Orkney. This was carried out to the highest of standards, so much so that once again due to the high quality of delivery, (and of course price) this is now a sustainable revenue stream for the future. Following the extension to Hatston Pier in 2014, the berth now offers 385 metres with 10.5-metre drafts and 40-meter-wide service areas on the pier. This, says Michael Morrison, is perfect for support vessels operating in the North Sea and west of Shetland as crew changes are easily facilitated with the airport only a 15 minute drive away.